Today, many healthcare organizations worldwide experience diverse and unique challenges in providing the best healthcare services to patients while controlling the delivery costs. Hence, they are now looking at technology as a facilitator for business procedure optimization. Through successful Healthcare Enterprise Resource Planning (ERP) they can be more prompt and efficient at delivering their services while keeping the costs down at the same time. To facilitate healthcare industry to deliver improved service quality at reduced cost, KENMedics™ provides enterprise wide visibility and many other useful tools that can enhance operational efficiency. This comprehensive, flexible platform delivers benefits across the entire patient-care continuum thus enabling the industry to focus on its prime objective that is patient care. In this ever changing healthcare arena, KENMedics™ facilitates hospitals stay more competitive and provide satisfaction to clients. To get more details about KENMedics™ product, please click here. KENMedics™ is specifically designed to optimize and transform the healthcare industry through Swash’s advanced Business and Technology processes. To get more details about Swash's technological platform, development and models, click here. Through our cloud based Healthcare ERP solution “KENMedics™”, healthcare organizations can provide better service to the patients at lower costs. By using healthcare industry integration standards it smoothly integrates with existing technology like your hospital information system. Here find out what you can expect from our Healthcare ERP solution. In order to provide quality health care services better and effective exchange of information is required. So that doctors can access all the important information including complete patient medication history, test results, treatment history and more. This will avoid chances of medical errors and improper medications. When doctors have complete medical report of the patients then the treatment can be done efficiently and it avoids unnecessary medical tests as well. It also minimizes the time taKEN for the treatment of a patient. Doctors can easily and efficiently prescribe the best medications, based on the past record and current health status of the patient. KENMedics™ benefits healthcare organizations by helping them properly utilizing the resources, helping them planning budget, and with the help of KENMedics™ they can even accurately add value to the existing operational system. Managing paper work and data is quite difficult, so understanding the problems of administrative department KENMedics™ can help manage all the data and making your work hassle free. It ensures the security and authenticity of information related to patients. All the relevant and important information can be saved securely. Medical reports of a patient can be easily transferred and accessed electronically through KENMedics™. KENMedics™ provides complete solutions for healthcare organizations. 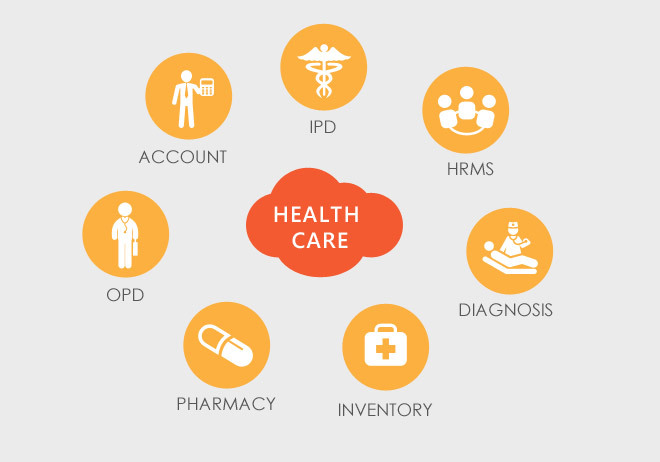 Here are some of the key features of our Healthcare ERP solution. In the healthcare service industry, KENMedics™ is rapidly developing as one of the most reliable and conspicuous hospital management systems. It facilitates hospital management by empowering hospitals to automate their core processes including clinical, financial and administration processes. KENMedics™, our cloud-based OPD management framework helps hospitals and healthcare institutions look after their patients effortlessly. It provides you more information about your patients by utilizing the most natural system accessible and helps you buildup better association with them, which will provide better results for your patients and your practice. KENMedics™, a cloud based hospital management system is particularly designed and developed to deliver possible benefits to multi-specialty hospitals and medical centers. KENMedicsTM enables Doctors to network 24 hours a day, 7 days a week and 365 days in a year to access critical information across various clinics, regardless of geographical location of clinics or doctors. KENMedics™’ Hospital Management System gives Interactive Applications to empower hospital staffs to access, control, and screen their own data while keeping personalized records, available over web and likewise by mobile devices over secure connections. Scheduling or organizing huge numbers of patient appointments crosswise over various departments and locations is a very cumbersome process. Hence, it needs an automated and streamlined methodology. KENMedics™ is the ideal solution for automating and integrating these tiresome tasks at healthcare facilities. KENMedics™ helps our clients take over huge volumes of complex information in an adaptable and versatile way, so they can literally speed up drugs and medical device time-to-market. Attaining quicker access to clinical trial and product use information is a vital part for supporting this objective.